Water is life but a cup of juice, or two, is the best way to refresh yourself and enjoy the moment. It is good that people have realized the importance of drinking natural juice extracted from fruits and vegetables with the use of the best juicers. Not every juicer in the market can give you the quality you need and deserve. There is only a section of the total that can be trusted to deliver quality juices with all the natural enzymes retained in it. This Breville bje510xl review will tell you all you need to know about it. Breville bje510xl is one of the best juicers in the market because of its perfect combination of innovative features, thanks to good engineering. The result is a convenient, efficient, and cooperative machine that, among other things, provide the yummiest juices. You can juice as long as you want with this machine. I love how this juicer performs in regards to speed and processing capability. It is very fast and powerful. The bje510xl has a 900 watt motor and comes with enough horsepower to extract juice faster from whatever ingredient it is you want to juice from. Unlike most juicers which lets you salivate for too long because they are too slow, with bje510xl, your juice won’t take too long. It is great for juicing hard fruits and vegetables such as carrots and apples. The bje510xloffers 5 control options to choose from. It presents five variable speeds for greater flexibility and control. It makes it easy for you to use since you can choose to alternate the quality or choose the texture of you juice. Every option or speed has its unique importance. You just use a knob to select the speed you want it to use. All the speeds produce delicious juice and none of them compromises the presence of nutrients in the juice. The most important thing about a wide chute is that it saves you from the work of chopping ingredients into small pieces before juicing. The bje510xl boasts a wife feed chute, which makes it a really convenient choice. It accommodates larder pieces. In fact some fruits and vegetables don’t need chopping at all before juicing. They are put into the feed chute whole. The wide feed chute also makes it juice faster. Its cutting blades are enhanced with titanium to help keep them sharp much longer. The sharp cutting blades cut the ingredient pulp against a quality stainless steel mesh filter basket for more efficient juice extraction. When the process is excellent, the yield will definitely be excellent too. The process of extraction is gentle on the natural enzymes in the ingredient. Nutrients are carefully transferred with the juice. This is one of the innovative features that add attraction and ability to the juicer. It boasts a sleek and modern display screen that shows the different speed settings. The screen also shows the type of vegetables and fruits recommended from each speed. It perfectly easen things for you as a user, and minimizes chances for mistakes in juicing. Q: How is it structured to maintain safety standards? A: Features such as vibration control system, which minimizes noise, and safety lock mechanism that prevent unsafe operation, ensures your safety. It also has overheating protection that automatically turns off the juicer to prevent the motor from damage. Q: How easy is it to clean? A: The good news that it contains top rack dishwasher safe parts that are not stressful to care for at all. Q: What is its durability status? A: The fact that it is constructed from high grade materials explains it all. It has a sturdy construction with durable materials. It will last you years if you take good care of it. 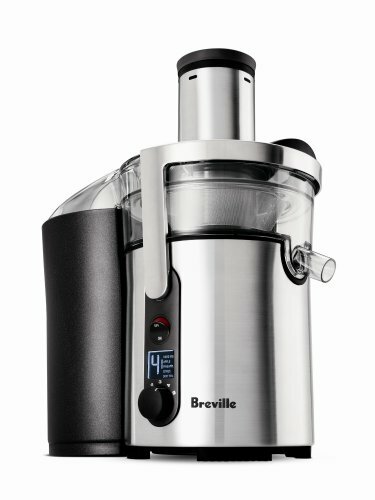 If you value the quality of the juice you drink, then you should consider getting Breville bje510xl as your next juicer. It never disappoints in delivering delicious juice. It makes juicing enjoyable. You will realize that the juice tastes just the way it should when all the nutrients are retained in it.